Fundamentalist groups use religion to carry out inhuman crimes. There are those that react by proposing a war on religions, and those who, instead, like Pope Francis, explain that greed for money, power, control of territory and resources is behind war. This greed uses religion to mask itself. In regard to religions, Pope Francis is convinced that their mobilization can halt war and guarantee peace. 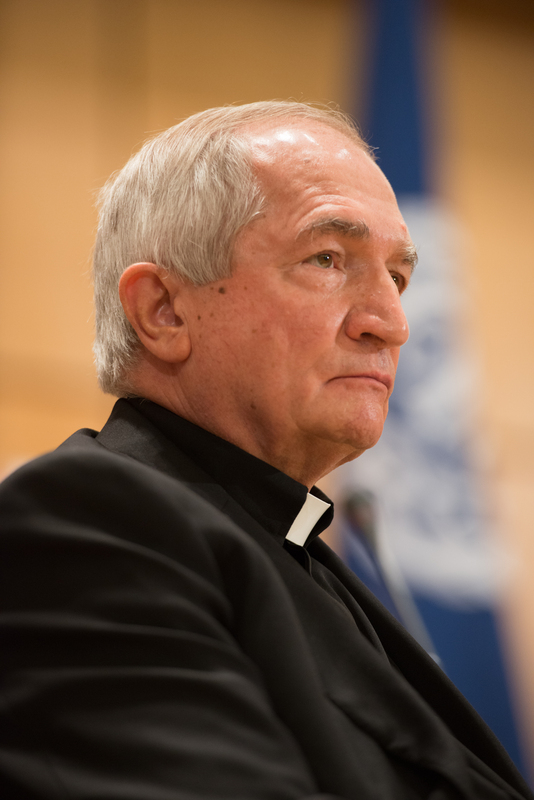 In order to understand the Holy See’s point of view on the present situation, ZENIT interviewed Archbishop Silvano Maria Tomasi, who at various times in his long service to the Church has been Secretary of the Pontifical Council for the Pastoral Care of Migrants and Itinerant People, Apostolic Nuncio in Ethiopia, Eritrea, Djibouti and Permanent Observer of the Holy See at the United Nations in Geneva. ZENIT: Fifteen years after the collapse of the Twin Towers, a war has unfolded, which is not yet placated. <There have been> armed clashes with terrorist groups and various armies that, after setting Afghanistan and Iraq on fire, have extended the fire from Libya to Egypt and Syria, <a fire> which is now threatening Turkey. Moreover, terrorist groups have attacked Europe and lighted fires in Africa and Asia. How do you assess this? Archbishop Tomasi: Fifteen years after the collapse of the Twin Towers, we have seen that at first the United States and the Soviet Union evaluated the situation, controlling their areas of influence and limiting the conflicts, in an effort to control the violence. Once the USSR collapsed, the United States was unable to create an alternative of global alliances to stabilize the world, and it has also lost political power. In the meantime, countries and non-State entities have emerged with a strong claim of group identity and the desire for power over <territories> and over peoples. These non-State groups have made cruel and irrational use of violence, appealing to religious motives, with particular recrudescence on the part of fundamentalist groups of Islamic matrix. Pope Francis is right when he says that it is not about a “war of religion,” but it is evident that religious arguments are used as an instrument to lure adherents, create group identity and engage in violence in a way that is repugnant to human nature, such as the killing of children and innocent people. It is necessary to analyze more concretely the source of funds that fuel these irregular armies and who furnishes the weapons. It is estimated that last year <$1.7 trillion> were spent on military expenses and the arms trade. A couple of months ago, I took part in the Humanitarian Summit that was held in Istanbul. In that context, the first United Nations attempt emerged to create a global co-responsibility to respond to humanitarian emergencies. It was estimated that at least $20 billion would be necessary. Well, while $1.7 trillion is spent without difficulty to fuel wars, it’s difficult to find $20 billion for humanitarian emergencies, to help the many innocent victims. The 20 billion dollars would be used to build schools, roads, bridges, hospitals — not for bellicose devices that offend and kill. This lack of logic and coherence on the part of Governments and States leads to a fragmentation of the planet’s civil community, with national interests clashing against the interest of the global good. The International Community’s objective is to placate the winds of war, seek peace and satisfy the needs of poor countries. ZENIT: How is the immigration emergency inserted in this context? Archbishop Tomasi: In recent years immigration has witnessed a disordered increment of arrivals and applicants, especially on Europe’s borders. The anomalous push to enter Europe has made the Union’s weakness emerge. In any case, it’s clear that immigration isn’t the problem but rather the inability to manage the migrations, because there isn’t unity or sharing or common interests to act as a political entity on the part of the European nations. ZENIT: After the murder of Father Hamel in France something unexpected happened: Imams entered Christian churches to express their solidarity for the victims; they manifested their common interest in opposing terrorism and impeding religion being used to kill innocent people. How do you assess this unprecedented move? Will it be enough to consolidate peace? Archbishop Tomasi: Islam’s presence in Europe has sparked an intense debate on the public role of religions in society. In this context, the secular and enlightened culture has felt challenged, while Muslim citizens want to express their religious identity publicly. The Imams that condemned the killing of Father Hamel observed that no action that intends to cancel the public role of religion is acceptable. The convergence of interests between Christians and Muslims was welded in having the right of religious freedom recognized in public life. The symbolic expression of this convergence was manifested with the presence of Imams and Muslims together in many Christian churches, to reject violence in the name of religions. There was also resistance; some did not understand and were not pleased. This is understandable because we are at the beginning of a new way. It is the first time it happens and neither the Christian community nor the Muslim community has experience of such encounter. In this time of change, it is necessary that intellectual and religious leaders of the Islamic tradition express themselves collectively, to say clearly that the use of violence in the name of the Koran is not the way indicated by the Muslim religion. There is need to reinforce this way. ZENIT: Since the beginning of his pontificate, Pope Francis has appealed to religious communities to halt the wars. Popular consensus supports the Pope. In your opinion, will he succeed in extinguishing hotbeds of war? Archbishop Tomasi: In the Christian tradition Jesus in known as “Prince of Peace” and from here, in the course of the centuries, slowly and with different interpretations, we have finally arrived at recognizing peace as a gift of God, necessary condition for the development and cooperation of peoples. Everything is lost with war. War doesn’t pay in any way. While, as Pius XII said before the outbreak of World War II, everything is gained with Peace. The Holy Pontiffs sought to impede armed conflicts in every way. Benedict XV tried to impede World War I, but the governments didn’t listen to him. And we have seen how many victims and how much suffering that conflict caused. Now we see that the commitment, the example, the prayer of so many decades is bearing fruit. War does not find public support; on the contrary, a mentality is imposing itself that proposes negotiations, the use of diplomacy and in any case non-conflictive ways to bring about peace. Pope Francis’ popularity is growing because he speaks clearly and simply. He touches the heart of those who are suffering the consequences of injustices and wars. With his way of doing things, Pope Francis responds to the aspirations of peoples and religions to live in peace and avoid violence. ZENIT: On September 20 the Pontiff will go to Assisi to meet with representatives of other religions and to pray together for Peace. What do you expect from this? Archbishop Tomasi: On September 19 the first world summit of Heads of Sate and Government will be held at the United Nations in New York, to find solutions to the phenomenon of immigrations. Answers of solidarity and sharing will be sought for a phenomenon that is marking the 21st century. At the same time, Pope Francis will encourage the different representatives of the religions to a globalization of solidarity that will generate peace and development as indicated in Laudato Si’. The Assisi meeting is an experience in which the different religions try to work together, discovering many common elements. Religions are not the problem but anti-religious fundamentalism is.